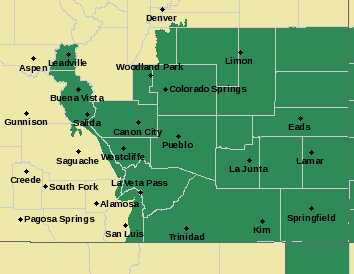 The southeast quadrant of Colorado will be under a flash flood watch Saturday afternoon, while temperatures will be pleasantly cooler - running 15 to 20 degrees below the highs from a few weeks ago. A strong monsoon moisture flow entrenched across the state, and an upper-level disturbance over the eastern portion of Colorado, will result in afternoon thunderstorms - some potentially severe later in the day - followed by heavy rain overnight. 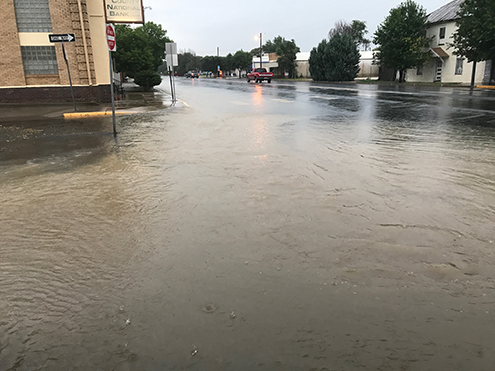 The National Weather Service has issued a flash flood watch that will take effect at noon Saturday and continue into the early morning hours of Sunday. Heaviest rainfall over the next two days will be over the eastern Colorado-Kansas border counties, with the eastern half of Cheyenne, Kiowa, Prowers, and Baca counties receiving as much as three inches. The western half of those counties, along with part of eastern Las Animas, northeast Bent, central Lincoln and the southern half of Kit Carson counties looking for up to two inches. Southern mountain areas can also expect up to two inches of rain through Monday morning. 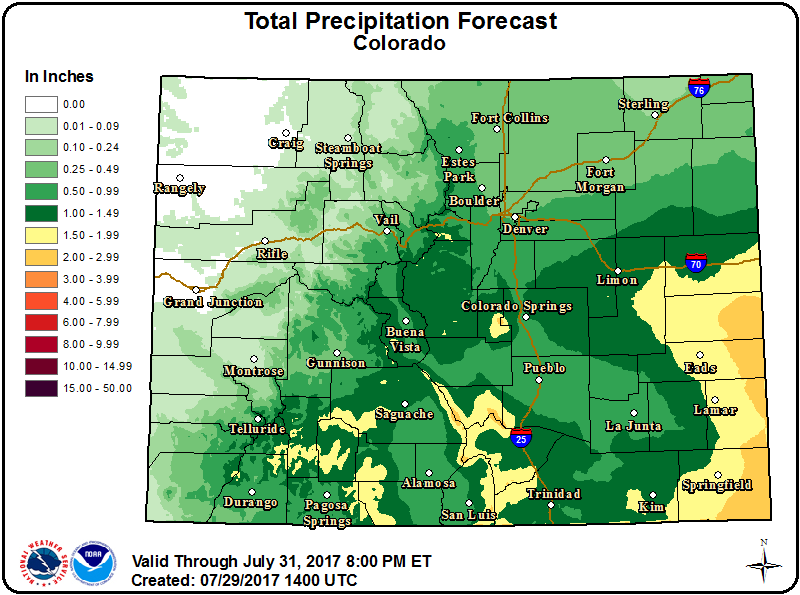 Soils are mostly saturated following several days of heavy rains, increasing the flash flood risk. Recent burn scar areas are particularly prone to flooding, along with mud and ash flows. Saturday's storms also bring the potential for wind gusts up to 60 miles per hour and one-inch hail. Weekend temperatures will mainly be in the low to mid-80s, with some upper 70s further south and west. Cooler temperatures are expected to persist at least into the middle of the week. Overall, highs will be running below late July-early August averages, while the overnight lows will be around seasonal norms. Chances for rains will also continue into the coming week, though gradually decreasing by Wednesday.